Want to go further in triathlon? Are you a current swimmer or runner looking for a new challenge? Are you age 16-25? We offer a unique training experience here in Northeast Ohio. We teach the sport of triathlon as it is raced at the Olympic level. Called draft legal triathlon, it calls for a fast swim, cycling skills while riding in packs, and a fast swim. We coach a small group of dedicated athletes learning the sport and racing their way to the top! The team is coached by Coach Tim Edwards who is a highly skilled coach and is USA Triathlon certified for this format. You don't need to be an experienced triathlete to give this a try. If you are a good swimmer or runner, the other skills can be easily taught and honed into a highly competitive triathlete. Where can you go with the sport? There is no limit to where the sport of triathlon can take you! Do you have an Olympic dream? Want to turn triathlon into a professional endeavor? Want to represent the USA in international competition? Want to earn a college scholarship? We have a small team that works out together a couple of times a week with Coach Tim. On other days, you have an individual workout tailored to your needs and strengths. The team training goes year round but you can choose summer or year round options. Swimsuit and goggles, road bicycle, cycling shoes, helmet, team issued uniform, running shoes. There are several opportunities to race in the draft legal format. Each year there are two or three Elite Development Races for athletes under the age of 25. For athletes under the age of 19, there are four Junior Elite Cup races with the opportunity to qualify for Junior Elite National Championships. An Under 23 Continental Championship is also available. There is a collegiate draft legal race that you can qualify for by racing collegiate standard races. 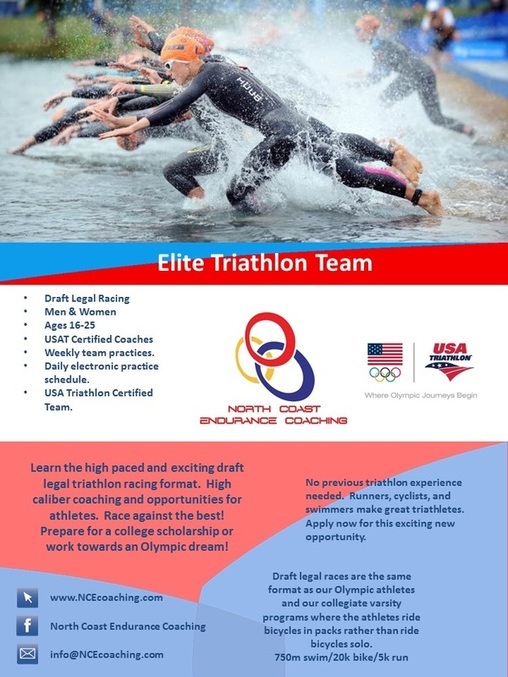 There is also an age group draft legal qualification race that leads to Team USA world championship qualification. We also race many single discipline competitions to train or learn skills such as criterium bicycle races, open water swims, and running races. The cost of the program is $150 per month (Scholarships are available). This includes the weekly team skills sessions and workouts, the daily electronic workouts, unlimited questions to the Coach, and support at races throughout the season. You can train year round or just for the summer depending on your goals.